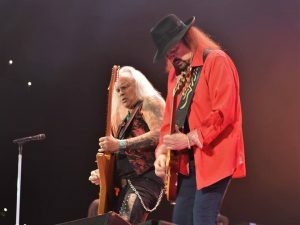 Southern rock’s most iconic institution, Lynyrd Skynyrd, brought its “Last of the Street Survivors Farewell Tour” to Baltimore on Friday with a raucous, classics-laden collection that defined a genre and has been winning fans for more than 40 years. With only one original member, Gary Rossington, left in the band, I half expected it to come off as a dim reflection of the original sound, a last fade to retirement, but this band surpassed my expectations. The vocals were strong and sustained throughout the whole set, the musicianship was outstanding – tight and precise where it need to be and loosely flowing enough – to see very clearly the band is not just out there playing by the numbers. If this does end up being Lynyrd Skynyrd’s final time around, there is little doubt it is going out swinging. The 90-minute set was a showcase that included all the hits from the band’s first five albums, with the one notable exception of “Give Me Back My Bullets,” along with a pair from the post Ronnie Van Zant era. 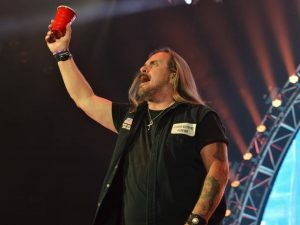 Like a true southern gentleman, lead singer Johnny Van Zant took time between several of the songs to express his gratitude for the generations of fans that have supported the band through the years. Skynyrd onstage is an army of its own. 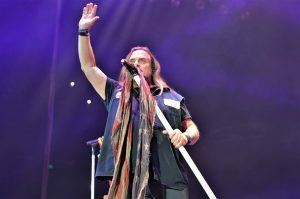 The core band comprised nine members, Johnny Van Zant(vocals), Gary Rossington, Rickey Medlocke and Mark Martejka (guitar), Keith Christopher (bass), Michael Cartellone (drums), Peter Keys (piano) and Dale Krantz Rossington and Carol Chase (background vocals) were joined at different points in the night by a three-piece horn section and guest harmonica player. Skynyrd’s past members were represented on stage as well, with several video and photographic montages interspersed with the music. The most poignant of these tributes came during the encore, “Free Bird,” which featured an unattended mic stand center stage topped with a signature hat from the band’s founding lead singer Ronnie Van Zant. While the song worked its way through the verses, a silent film of Ronnie singing the band’s most iconic anthem played overhead while his younger brother Johnny sang offstage creating a spot-on reverse lip sync. Lynyrd Skynyrd will continue the tour of the U.S. through the end of the year, and follow with a headlining spot on the Southern Rock Cruise in January, before taking the tour to Canada and Europe beginning in March of next year. Setlist: Workin’ for MCA, Skynyrd Nation, What’s Your Name, That Smell, You Got That Right, I Know a Little, The Needle and the Spoon, Saturday Night Special, Red White & Blue (Love it or Leave), The Ballad of Curtis Loew, Tuesday’s Gone, Don’t Ask Me No Questions, Simple Man, Gimme Three Steps, Call Me The Breeze, Sweet Home Alabama.